The noh stage is an extremely simple space in which there is no curtain between the playing area and the audience. Originally, noh was played in open fields. In order to retain the idea of performing outdoors, the modern noh stage, though fashioned indoors, is designed complete with details such as a roof, bridge with a handrail and a pine tree painted on the back wall. Another example of the thoughtful design is the change in perspective of the three pine trees that run along the hashigakari (bridgeway). The tree closest to the stage entrance is smaller than the one closest to the stage in order to give a sense of distance. In addition the lighting is arranged in such a way as resemble natural lighting. 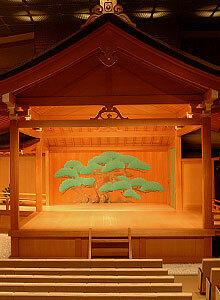 The noh stage is constructed from hinoki (Japanese cypress). At the back of the stage is the kagami-ita (back panel, usually displaying a painted pine tree). In the front of the stage is the kizahashi (decorative staircase). Coming off the left side of the stage is the hashigakari (bridgeway). At the end of the hashigakari is the agemaku (curtain) which marks the entrance to the backstage area. It is thought that this current standard stage construction was established just before the reign of the well known Shōgun Oda Nobunaga (circa 1550). The Northern Noh Stage, located Nishi Honganji Temple in Kyoto, is the oldest standing stage of this type of construction and is said to have been built by Toyotomi Hideyoshi. The complete noh stage is comprised of the hon-butai (main playing area), hashigakari (bridgeway), ato-za (seating section for musicians and stage attendants) and the jiutai-za (seating section for the chorus). The main playing area is 5.4m per side. The back wall of a noh stage is called the kagami-ita on which a pine tree called the oi-matsu is painted. This is said to be the eternal backdrop of noh. The Yōgō no matsu (The Yōgō Pine Tree) is said to be the model for which the kagami-ita is based, and can still be found at the Kasuga Shrine in Nara. While the noh stories may change, the backdrop does not. All noh are performed in front of the kagami-ita. Off to the right side of the main playing area is the jiutai-za (seating for the chorus). The back of the stage is known as the ato-za and is the spot reserved for the hayashi (musicians) and the koken (stage attendants). In contrast to the main playing area where the boards lie vertically, in the ato-za the boards are laid horizontally, and is also known as the yoko-ita. Running from the ato-za off to the left of the main playing area is the hashigakari (bridgeway). The hashigakari is used not just for entrances and exits, but also as another playing area for some important scenes. As opposed to the openness of the main playing area, the hashigakari is linearly laid out and consequently aids in creating a feeling of depth. The shite then can use the hashigakari to better express their mental state. There are two entrances to the noh stage, the agemaku and the kiridoguchi or kirido. 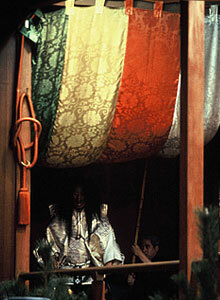 The agemaku is located at the end of the hashigakari and is the five-colored curtain that is raised and lowered for the entrance and exit of the shite, waki, tsure, waki-tsure, kyōgen, and hayashi. The kiridoguchi is located on the right side of the ato-za and is a small sliding door that is used for entrances and exits of the kōken (stage attendants) for both the shite and the hayashi, as well as for the jiutai (chorus). 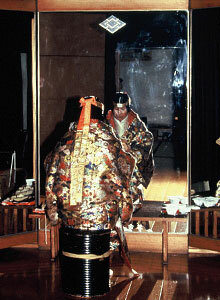 The kagami-no-ma (mirror room) is located behind the agemaku and is where the shite puts on the mask being used for the noh. This is also where the hayashi play oshirabe (warm-up music). It can be said that when the shite and hayashi enter this area, the noh has begun. The audience seating area in a noh theatre is called the kensho. The seats located in front of the stage are called shōmen, while the seats on the left side of the stage are called the waki shōmen. Audience members sitting in the shōmen section have the best view of the mask effects, while the advantage of sitting in the waki shōmen is the close proximity to the hashigakari. In between the two are the naka shōmen seats which lie in front of the metsuke bashira. 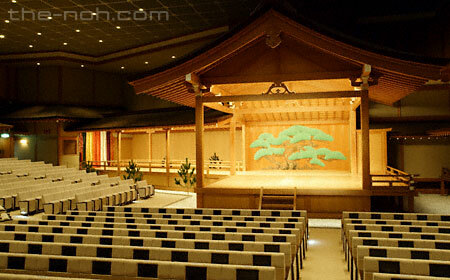 Older noh theatres have tatami rather than seats, while almost all large modern noh theatres are made with fixed seats. Some noh theatres are also equipped with balconies. 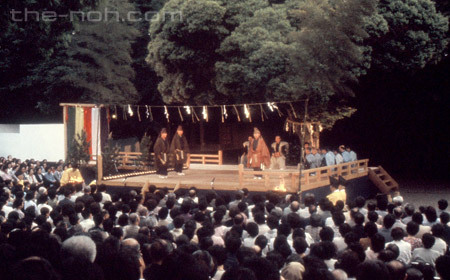 Long ago, noh was performed in open fields, while today it can be seen in a wide variety of settings: noh theatres, public concert halls or temporary stages. When performed in open fields it was many times in the service of a temple ceremony or a festival. Takigi noh (fire light noh) still utilize open fields to perform in. Above all, there are many noh performances, many locations, really any place can be a noh theatre. At the National Noh Theatre in Tokyo you can enjoy performances from all five shite schools and both kyōgen schools year round at a reasonable price. Along with performances, the National Noh Theatre also sponsors lectures and exhibits throughout the year. In addition, they have a substantial library containing books and articles concerning noh. Each shite school has its own noh theatre: in Tokyo, the Kanze Noh Theatre (with approx. 26 school sponsored performances and approx. 130 associated performances), the Hōsho Noh Theatre (monthly performances as well as many other sponsored events) and the Kita Noh Theatre (monthly performances as well as other sponsored events). In Kyoto the Kongō Noh Theatre presents a number of performances a year. At the Komparu Noh Theatre in Nara there are currently no performances scheduled. For the Japan-wide map of noh theatres click here. The outdoor performances of takigi noh (torch lit noh) have become popular all over Japan. Held on the grounds of temples, shrines or public parks, these performances combine the beauty and feeling of natural surroundings, with the grace and beauty of the performance on stage. In the early part of evening, a torch lighting ceremony takes place setting the stage for a magical evening. Takigi noh has as its origin takigi utage, the precursor to the popular shuni-e ceremony, which took place at Kofukuji Temple in Nara in the Heian period (794-1185). This eventually developed into takigi noh. 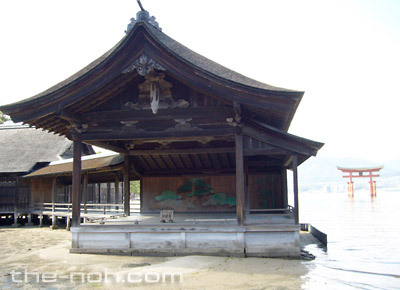 Even today on May 11 and 12 Okina is performed as a dedication at Kasuga Shrine and Kofuku Temple. It was only as recently as 1950 that takigi noh started taking on the implication of relaxing entertainment at the Heian Jingu Shrine in Kyoto.